There’s nothing better than watching a bit of touch football razzle dazzle on YouTube. When you unleash the likes of Shaun Johnson and Benji Marshall against just 6 defenders, magic happens. A sensational highlights reel from the Men’s and Women’s battles at the 2012 touch football State of Origin in Port Macquarie. Sizzling stepping, brilliant hole running and breathtaking cut out passes show you why our Australian Touch Football stars have the skills to match it with the best of the football codes. There’s even a little bit of fisticuffs to get the temperature rising! Michael Law from the North Queensland Tropical Cyclones rains on New Zealand’s parade with a super impressive display on début for the Australian Mixed Touch Football Team. The 21 year old electrician is one of the most exciting young prospects coming through the Australian system. If you play middle, watch and learn. For many years, indigenous Australians and New Zealand Maori’s have dominated touch football at the elite level. The fast twitch fibres and light stepping talent that comes so naturally to these players is on show in this touch football video. The 2012 clash between the Australian Indigenous team and the New Zealand Maori was a thriller, finishing 8-7 to the green and gold in a drop-off. Short, but oh so sweet clip of one of the best touch football steps you will ever see. Shades of Roger Tuivasa Sheck at his twinkled-toed best. This youngster channels the best of Quade Cooper, Anthony Milford and Karmichael Hunt all rolled into one. Apologies for the poor picture quality but this one is well worth a look. This clip showcases the skills of touch football’s very best in slow-mo so that you can fully appreciate the mastery at work. The first highlight sets the scene, with a compilation of super steps, thrilling intercepts and pinpoint passing from the Australia vs New Zealand Trans Tasman series. Our men’s, women’s and mixed teams all feature, showing you how it’s done at the top level. The New Zealand Warriors superstar has taken the Rugby League world by storm with his lightning speed, natural instinct and astute vision. His last minute heroics in the 2013 World Cup semi final at Wembley stadium clutched victory from the jaws of defeat for the Kiwi’s. The sizzling footwork he showed would be of no surprise to anyone familiar with Shaun’s touch football career as a youngster. This famous YouTube clip shows you why NRL front rowers wake up in a cold sweat the night before a game at Mt Smart stadium against the Warriors mercurial halfback. Dylan Hennessy starred for Australia’s open men’s team in the Touch Football Trans Tasman series of 2012. His fancy footwork and bullet-like right to left pass had the ball on a string for the green and gold in Mudgee. The 25 year old Sydney Scorpions star is one of the most gifted links the touch football world has seen, making his wingers look like world beaters and leaving defenders clutching at space. Last but not least, we bring you the silky skills of new Auckland Blues rugby union recruit Benji Marshall. Arguably the most famous step in rugby league history, Benji’s footwork has dominated the touch football field even before his exploits for Keebra Park High School caught the eyes of Wests Tiger’s talent scouts. Given the chance, Benji loves getting back onto the touch field with his mates in the off season, and this clip shows you why. Every social touch player’s nightmare comes true for these defenders – not much you can do but stand and applaud. 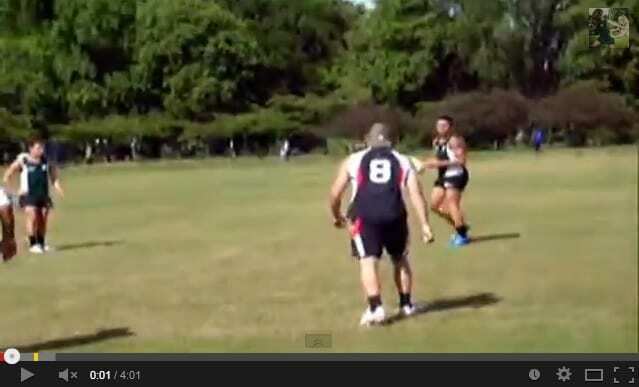 There you have it – some of the best touch footy videos on the internet. If you’re not inspired to get out on the park for a bit of razzle dazzle after that, you never will be! Grab a footy and some touch boots and you could be the next Youtube footy phenomenon.